We have teams leaving on Wednesday and Thursday for Alabama to compete at Chambers County Grand Prix/Chambers County Career Tech Center. Races will be held Friday, April 12th and Saturday, April 13th. From there we head out on Sunday for Leeds Alabama to race at Barber Motorsports Park on Monday, April 15th. Saturday, April 6th is our last local race of the season. It is our Speed Event where teams go for speed instead of endurance. Race day is broken up into multiple 20 minute segments instead of 1 hour events. Teams will race in their class instead of as one large group. The strategy is totally different as gear ratios, motor set ups and computer setups are different than long distance. You will not kill a set of batteries in 20 minutes like you could in a one hour event. Between events there will be a Sponsors Race. This is where team sponsors will take a turn in the cars, it they can fit, and see how they do compared to their team drivers. Come out and see the races and wish Fredi and Tom good luck in their next chapter. Most people retire and move to Florida. But not Fredi and Tom. They will be leaving shortly for their new home in Indiana. Something about being closer to family. Fredi has been a very big part of the success of our program over the years and we will miss her greatly. There will be an ETO event at Square 1 Burgers in Brandon starting at 5.p.m. to formally send them off on their next adventure. 2042 Badlands Drive in Brandon between Brandon Parkway and Providence Rd. There is a separate room reserved in the back. Adult beverages are available. Teams are encouraged to do something special on their own if they choose for Fredi and Tom. Electrathon of Tampa Bay will hold their next event on April 6, 2019 at Brandon High School, located at 1101 Victoria Street, Brandon Florida 33510. This event is one of our most exciting events for our teams and members. Our ETO Teams, Sponsors/Principals and Executive Board Members will DASH around the oval track at the safest and fastest rate of speed that their car can perform for 20 minutes. Once again, the key is “SAFEST”. Our race steward will black flag any driver/car that is not operating with safe driving techniques. We will have members of the Great American Celebration of Speed attending this event to observe and learn more about ETO as they have invited us to their upcoming World Event on October 11 – 13, 2019 at Daytona Speedway. It will be an honor to have them at our event in preparation of us joining them in October. Bring the entire family to this FREE, FUN, FILLED day of Electrathon Racing. Racing on the track at Lennard High School for the first time was a huge success. Lennard’s Team had their cars back on the track after an extended absence and took 3rd in the High School Class against some tough competition. The track at Lennard is in great shape. It is 8 lanes wide and seal coated which made for some fast lap times and minimum tire wear. Thank you Team Sponsor Jim Reve for making sure we had a great race day and a special thank you to his wife and volunteers for doing their fundraiser that had great food and drinks for all. In the Advanced Battery Class it was USF in their 48 car running a perfect race and setting a record of 230 laps on the 1/4 mile track over two races with the best lap time of 26.914. USF Team sold one of their cars, the 132 car, to Ryan Norden formerly of Middleton High and Duck car infamy. He did very well for his first time out in the Lithium powered car. Everything was doing well in the first race until he had a flat tire late in the race and had to withdraw. In the second race he put up an impressive 103 laps finishing second for the day with 196 laps. In the Open Class it was Silver Bullet/Robinson Racing car 94 and Tiger Racing car 4 going at it again. Silver Bullet/Robinson had a total of 195 laps for the day with a best lap time of 32.213 and Tiger Racing had back to back 94 lap races for a total of 188 laps and a second place in the Open Class. Jim Robinson designed cars filled the track (9 of the 10 cars). Jim must be doing something right with his designs. His personal car has a suspension integrated into the design. Something about making racing easier on his old bones. In the High School Class it was Mulberry High School car 38 leading the pack AGAIN. They even took a 3rd in total laps in the second race with 99 laps, beating the open class cars by 3-5 laps. They finished first in the High School Class for the day with 187 laps. Simmons car 35 had a good day taking 2nd in class with 174 laps for the day. They are working on a new car and should be highly competitive with it. Simmons cars (35 and 53) are running on some old batteries or they would be finishing higher in the standings. Lennard had both their cars out for this one and did well with their 86 car taking 3rd with 157 laps in the High School Class with a best lap time of 31.151. Their car 78 had battery problems and did not have a good day. It was good to see them back on the track. The team from Brooks DeBartolo High School had the events of the day in their 55 car. In the first race they did a beautiful spin out on the turn by the start finish line when the driver got the inside wheel into the sand. The car spun and then got going again all in one motion. In the second race we saw something never before seen in a local race. The driver only weighs 105lbs causing the car to require A LOT of ballast, installed and bolted down by the nose of the car, the drivers boots were getting in the way of her working the throttle. Part way thru the race we see the car pull into the grass infield on the far side of the track and we see a shoe being thrown out of the car and an infield crew member giving her another shoe. A few laps later we see the car pull into the grass in the same area and here come the shoes being thrown out of the car again and more shoes being handed to the driver. After the second pit stop for shoes the 55 car ran well for the rest of the race right up till the batteries died and they had to withdraw. Now that is real teamwork. 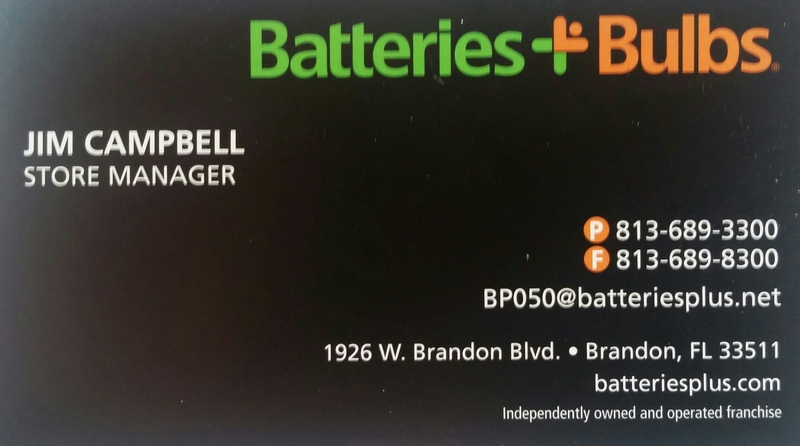 Brooks like most of the teams in the High School Class are battling a problem with old batteries. Batteries are the single most expensive item in these cars and at $400 + per set times two sets per car, High Schools have a hard time replacing them when needed. As Seen In The Pits Most teams now have the proper type of battery chargers and some are loaning other teams chargers to help out. Some of the teams are switching to moped tires. They are bigger than the BMX bicycle tires most teams use but will last most of a season instead of a few races. Even saw one team give another team a Master Power Cut Off Switch so they could pass inspection and race. Our next race is going to be at Brandon High School on April 6th. This will be our DASH EVENT. Multiple 20 minute races and a Sponsors Race. Come out and see us try to fit into these cars. Charlie already has tentative dates for the 2019/2020 races and is working to finalize one of them at Steinbrenner Field in Tampa another one at DAYTONA SPEEDWAY and a third one at an Airfield in Ft. Myers. Stand by for more info as it becomes available. Our short timers, Fredi and Tom are packing for their retirement move to Indiana. PLEAS DON’T GO. Isn’t that opposite of what most people do? They are waiting till after the area thaws. We will be having a Going Away event for them as soon as we get a definite get out of town date. In case you missed it we were on TV Channel 28, they had a short clip of the start of our race on the 11 P.M. news on Saturday night, clip is at the beginning of this write up. 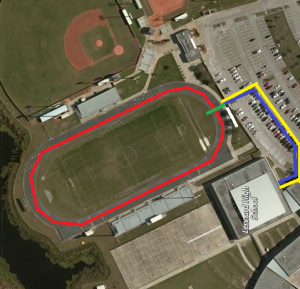 Our next race will be held at Lennard High School, located at 2342 Shell Point Road, Ruskin Florida 33570. Thanks to Sponsor Jim Reve ETO will hold our second race day ever at Lennard HS and we are looking forward to a great turnout. Our course will be an oval, on the track at the school. The pit area will be outside of the track/football field in the parking lot. The first race will lineup at 9:45am and the green flag for the 1 hour race will drop at 10 am. The second race will line up at 12:45 and the green flag will drop at 1 pm. Once the second race is completed, teams will assist with course and area clean up before the awards ceremony. 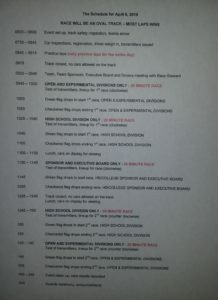 Lennard HS Electrathon Sponsor Jim Reve will have a fundraiser (lunch stuff and coffee). Please support them by purchasing your food and drink items from them. Bring the entire family to this FREE, FUN FILLED DAY of Electrathon Racing. Terrible weather all over the place EXCEPT in Florida. Here we had to deal with an overabundance of sunshine and terribly mild temps. While others were digging out of snow. Mulberry High School had their cars on display Friday for the USF Engineering Expo, which drew over 8000 students, it was quite a crowd. ETO Fredi and Charlie joined the students from Mulberry High School. Mulberry’s team greeted the visitors and answered questions about their cars and Electrathon racing. They did a great job! It was also a great day for ETO as other schools and enthusiasts stated they wanted to come on board to race and traded contact info. In the Open Class (or the AARP class this race) saw Rodney Schreck from Tiger Racing car 4 and Jim Robinson and his co driver Jerry Bristow from Robinson Racing car 94 battle it out over the two races. Robinson Racing had ANOTHER NEW CAR (finished just the night before the race) for this race. In the 1st race it was Robinson Racing by four laps. In the 2nd race Rodney changed his gear ratio and it was a fraction of a second difference at the finish (1.00.01 VS 1.00.02). Robinson Racing might have done a little better if not for dragging a chunk of tree moss around the track for most of the second race. Robinson Racing took 1st in class with Tiger Racing in 2nd in class. In the Advanced Battery Class it was USF car 48 in a class all by themselves. In the 1st race USF put up some impressive numbers with 80 laps. In the 2nd race USF car 48 was again putting up some impressive lap counts. On one of the S curves USF and I Will Mentorship Foundation (IWMF) both tried to occupy the same space, IWMF car 139, a High School Class car, went up on the curb. Neither car received any damage. In the High School Class it was Mulberry car 38/83 and Simmons 35/53 going at it again. Mulberry car 38 came out on top with a smooth and steady day on the track while car 83 had battery issues. Simmons car 35 broke a weld at the line up for the first race and did not make it back to the track. Mulberry car 38 took 1st place in class, Simmons car 53 was right behind in 2nd place. The new team on the block, I Will Mentorship Foundation (IWMF) came in 3rd in the class and this is only their second race day. They were doing real well. In the first race they went out a little too fast and had to withdraw part way thru when the batteries ran down. In the second race they withdrew after the problem with USF to inspect the car. They are figuring out battery management and their car but still managed a strong 3rd place. Watch out for them in the future. Mulberry’s car 83 finished in 4th place in class. Our next race will be on the track at Lennard High School. It will be a good opportunity to get some laps for new drivers and test out gear ratios. Teams should be thinking about the upcoming out of town races at the Barber Motorsports Park in Leeds, Alabama (April 15th, over 50 cars come for the race) and Five Flags Speedway in Pensacola (April 27th over 25 cars come for the race). If interested you need to coordinate with Charlie as soon as possible as ETO will transport high school teams car(s) as long as two high schools agree to attend. 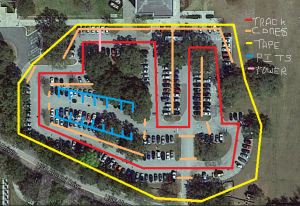 On Friday, February 15th our teams will display their cars at the USF Engineering Expo. The USF Engineering Expo that is held every year in February, seeks to educate K-12 students on the importance of math, science, engineering and technology within their lives. The Expo (9:00am – 4:00pm) features hands on exhibits and shows that help encourage more students to pursue fields in science and math. Our Electrathon Races will take place on Saturday, February 16th, line up for the first race will be at 9:45am and the green flag will start the one hour race at 10:00am. After the first race, our teams will have their cars on display in the pit area for guests to check out and ask questions about their car and Electrathon Racing. The line up for our second race will be at 12:45pm and the green flag will start the one hour race at 1:00pm. The goal for our teams during the race is to conserve their battery power so that they last the entire one hour and still have the most number of completed laps in their class of cars. 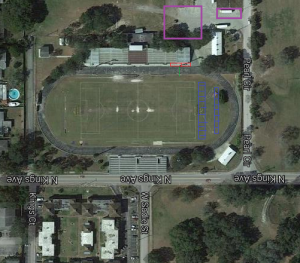 The University of South Florida is located at 4202 East Fowler Avenue, Tampa, Florida 33620. Please come out and enjoy two FREE FUN FILLED DAYS for the entire family. Electrathon of Tampa Bay is proud/honored to announce the retirement of Fredi Beck from Hillsborough County Public Schools. Fredi has served the School District for 30.5 years, they have lost an outstanding individual from their ranks, good luck on filling her shoes. Fredi and Tom (Husband) plan to relocate within the next few months to Indiana to be with family and friends. When this takes place, Electrathon of Tampa Bay will loose so much, her knowledge, skills, smile, friendship, dedication and love that she has given us for so many years to our organization. 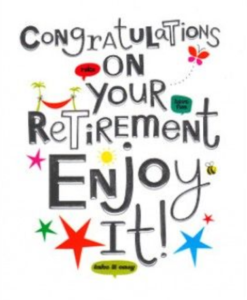 Please reach out to Fredi, show our ETO love and respect by congratulating her on her retirement from the School District. The first race of 2019 is in the books. What a start to the new year. New teams, new cars, old cars, spin outs, chains coming off, electrical wiring disasters. Just another race day. We want to thank Chris Hart of Wharton, our host, and the Wharton Administration for allowing us to use their facilities. Thank You Chris for doing a fundraiser as the hotdogs and burgers were much appreciated. A shout out to Larry Plank from the Hillsborough Count Public School front office for stopping by to see the races. A special thanks to Ryan Norden (Middleton Alumni) for helping with set up and for being our race steward for the day. In the Advanced Battery Class it was USF racing against themselves. At the start of the first race the USF 132 car (John’s) was in the pits with wiring problems where it spent the whole race. They did make it to the second race and appears to be getting the bugs worked out so they can challenge others in their class. The USF 48 car (Sai) started the first race and did well, the batteries were not charged enough to start the second race at line up but did make it onto the track. It still placed 1st in class. They took advantage of points strategy to keep their class lead. In the Open Class it was the Tiger #4 car in a class by itself. Rodney did well in the first race but had to withdraw part way thru the second race, not something that happens often to our 20+ year racer. The High School Class had a new team and two new cars from the I Will Mentorship Foundation (IWMF) out of Ft Myers. They get the prize for the Best Team Trailer and Tow Vehicle combo. The team looked good and put on a good show of team work. They took 4th place with their 139 car. It is a modified Blue Sky car. They had chain problems that kept them out of the top 3. Their second car the #28 and a loaner from ETO had a problem with the wiring harness going into the wheel motor and despite the best efforts of many hands was not repairable. New teams with new cars tend to have problems early on and they did a great job of working thru them. We look forward to seeing them at all of our races. The Brooks teams #55 car was plagued with problems and finished in the 5th spot. They are a strong and hard working team. The teams from Mulberry and Simmons continue to battle it out for the top three spots. Mulberry had a 50/50 day with the 83 car having a bad battery day and finishing in the pits and their 38 car finishing 1st overall in the class. The Simmons team 35 car finishing hot on the bumper of Mulberry and the 53 car not far behind. Seven points separates the Simmons and Mulberry teams with Mulberry holding the upper hand. As Seen In The Pits. There were many challenges during the course of the race day and I want to commend ALL THE TEAMS for jumping in and helping each other. On the track it was go go go. In the pits it was help each other to get back onto the track all day. This is what Electrathon of Tampa Bay is all about. Our next race is our showcase race. We will be at the University Of South Florida College of Engineering Expo on February 15-16. Friday, February 15th will be a static display by some of our teams. Saturday, February 16th will be THE BIG RACE. 10 AM and 1 PM. WE hope to see everyone there. We will be setting up the course Friday late afternoon and any/all extra hands will be appreciated. Coordinate with Charlie. On another note: The Electrathon of Tampa Bay Board Members present, voted Ryan Norden onto the Executive Board as an Intern to learn the operations of the organization. Welcome Back Ryan!